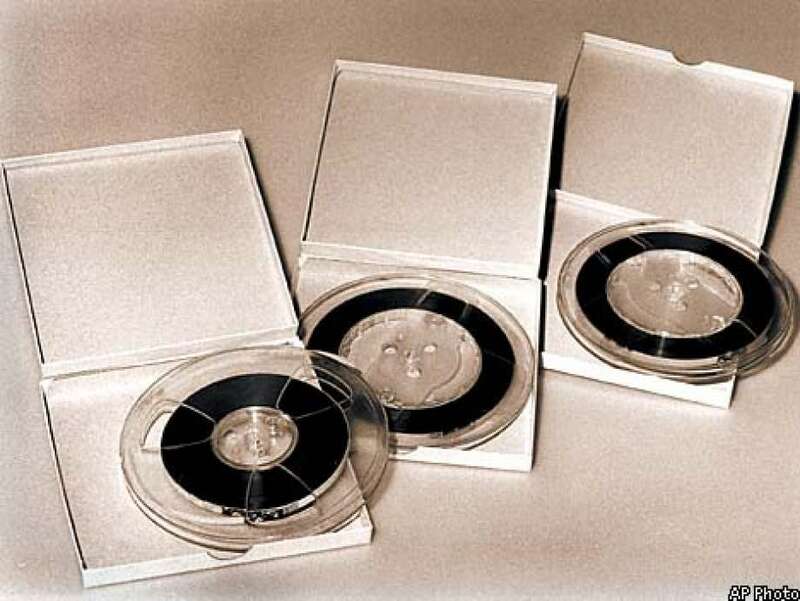 April 29, 1974: At first, Nixon offers transcripts rather than tapes. Source. Today, Elizabeth Drew's article, "Holding a President Accountable," was published on the New Republic's Web site. Just seeing her name reminded me of the Watergate case which she chronicled in her book Washington Journal: Reporting Watergate and Richard Nixon's Downfall. In today's article, Drew lists the factors that make removal of Donald Trump from the presidency highly unlikely, despite the strong case she makes that Trump's mischief against the accountability process far exceeds what Nixon attempted. Drew is also one of the many voices of the Watergate era that are featured in Slate's podcast Slow Burn (season one), devoted to that high drama. A couple of nights ago I listened to the final podcast of the Watergate epic. As the podcast documents, one of the turning points for some of Nixon's staunchest supporters was a voice artifact from the last batch of tapes demanded by the independent prosecutor's office -- a recording of Nixon ordering that the CIA be told to contact the FBI with a request to back off. The release of that incriminating tape led to the collapse of Nixon's remaining support and his resignation just days later. That recording has been nicknamed the "smoking gun." 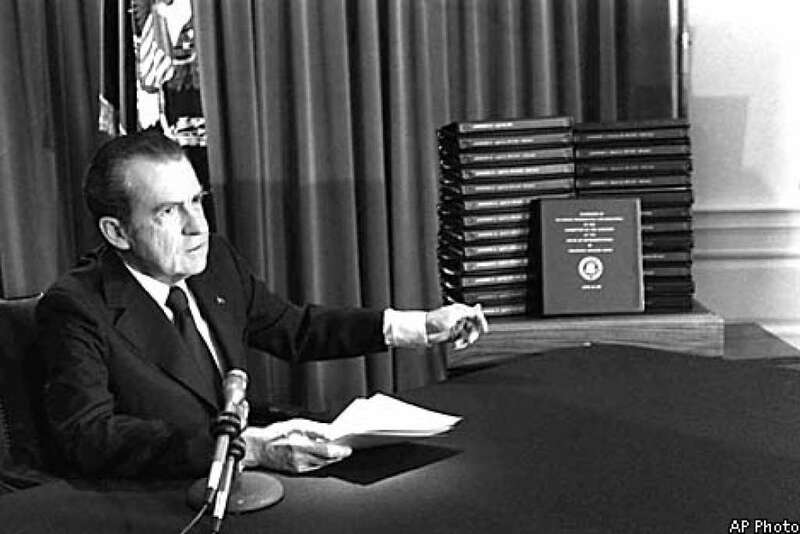 In the comparison between Watergate and the Trump presidency, some have noted the absence of a similarly dramatic moment of shock in the current situation. However, the full contexts, then and now, are not comparable. Part of Watergate's shock was the dramatic contrast between the respectability of Nixon and his family and his political party, on the one hand, and his cynical manipulation of power behind the scenes, along with the [expletive deleted] language on the recordings that so shocked Billy Graham and others invested in all that respectability. Today there is nothing but shock. The news cycle is an unending chronicle of insults, innuendos, power struggles, dog whistles. At the center of this chaos is the "chaos president," whose sole point of reference seems to be himself. We search in vain for a single smoking gun because the whole edifice of normal governmental accountability is on fire. And you never heard him (him, meaning the President) say, "What's the right thing to do for the country? What's the right thing to do under the law?" It was always kind of "how do you get away with this" and "how can we stonewall here?" It was just, you know, like thieves conspiring and plotting and scheming. Of course we cannot conclude that Nixon never agonized over the ideals he seemed to be trashing, just because he never did so on tape. Similarly, we can't know for certain that the private Donald Trump does not at least occasionally wonder whether he is fully living up to the high expectations of his office. But the public silence is deafening. The people who surrounded Richard Nixon probably do and did love their country, and had their own peculiar sense of what that meant. It is still not clear that Colson understands why his country is being "torn apart." It is as if these people were utterly detached from what they did. And, having manipulated the symbols -- country, flag, religion -- they are inevitably suspected of continuing to do so. When Colson turned to religion, he was seen as engaging in the ultimate manipulation. That he then talked as enthusiastically about Jesus as he had once talked about Richard Nixon does not mean that he has not believed firmly in both. The religiosity of the men around Nixon was and is a striking thing, and it is something very hard to deal with. It is not polite to mock or suspect people's religious beliefs, and these men used that on us. They made their patriotism and their piety part of their politics. All of which gives fresh meaning to the point that we have a government of laws. I spent the Watergate years in Canada. Back in 2005, I briefly recalled some of my memories of that era. During those years I was getting my undergraduate degree at Carleton University in Ottawa. When the famous Saturday Night Massacre occurred, I dropped everything and took a bus to Montreal and a train to Washington, DC, blinking in the morning light outside Union Station and finding my way to the White House fence, where I found others from all over the country who had been drawn by the elemental currents of history to gather at that spot. The eve of Nixon's resignation, National Arts Center, Ottawa ... Ottawa's own Rich Little performed as part of a four-day engagement (if I remember correctly). Rich Little was well-known for his Nixon impression. He obliged again that evening. I was there for that apparently historic performance—I'm told that the next day he dropped that part of his act. Someday I'm going to have to look at my diaries from those years and see what I noted on a day-to-day basis about Watergate. After all, I was a political science student ... although my focus was the Soviet Union. Craig Thompson: I don’t think I’d ever heard the phrase "disenfranchised grief" before I came back from living overseas. Morgan Lee conducts an amazing interview with Rachael Denhollander on Larry Nasser, the Gospel, forgiveness, and justice. Mary Elmes, a Quaker heroine who chose obscurity: a profile and book review in The Times of Israel. Is the white, middle-class, well-educated sector of American Quakers facing "a steady slide of downward mobility"? Chuck Fager presents the evidence. V.V. Putin, the short course -- from oligarch to kleptocrat. Author Ruth May necessarily leaves out a lot of details, both positive and negative. The biggest positive omission: the stabilization of the country's economic life after the chaos of privatization and default. Maybe the biggest negative is here. Despite their fame and enduring importance, the Rolling Stones have been almost invisible to the Grammy voters. But this year they won the Grammy for traditional blues, for their Blue and Lonesome album. (Two tracks below.) The album is a great romp, but the best of a whole year of blues? Really? "Hate To See You Go." Nice music, but couldn't they have done better than this cliche-ridden "urban" collage of a video? These are compelling words for while they can be turned against Donald Trump; they can also be turned against Hillary Clinton, The Democrat Party Leadership, and the leadership of the FBI. It is the nature. of the process of being guided, ruled, and informed, by outward political and religious forms, ideological constructs and contrivances, that conspiring, plotting, and scheming wil manifest in the conscience and consciousness of men and. women to defend, at all costs, their outward religious and political contrivance. Yes, Romans 3:23-24 doesn't just apply to the politicians we oppose, but to everyone. Just as awkwardly, maybe these discussions can restore perspective, even to the point where a politician experiences a conversion: "Oh, I forgot who I really work for, and why!" When we don't see political heroes raising up the banner of ethics and values on our behalf, it remains up to us to be persistent in defending those values, applying our standards fairly, contributing to hope rather than cynicism. We cannot let D.T. off the hook, because he's in a place of great leverage for good and evil, and there's abundant evidence that he conned his way into that place. But exaggeration and deceptive practices are common in politics, including among some of his opponents, and it doesn't do anyone any favors to pretend otherwise. Yes, it is true that those whose conscience and consciousness is guided and informed by outward ethics, values, and standards, and who look toward and support leaders who defend and promote their outward principles, will seek to use outward forms and contrivances to leverage outward leaders to conform to their political and religious constructs. That is the way of things with those whose conscience and consciousness are guided by outward constructs. It is the nature of the process of participation in and idenitification with outward political and religious contrivances that such devotion to outward constructs nurtures the manifestation of outward elthics, values, and standards, that does conform with and that are not guided by the same outward principles and contrivances. The process of consciousness anchored in and a conscience informed by outward ethics, standards, and values, by the very nature of the process itself, nurtures conflict and does not bring resolution. Their is another way wherein people are come into a conscience and consciousness ruled and guided solely by immanent Presence itself in itself without regard for the process of participation in and identification with outward ethics, values, standards, and the professors of that process. In this way, those outward leaders, and the conflict they nurture, by teaching and leading people into being guided and informed by outward political and religious contrivances, are neutralized and conflict is laid down. With that said, your use of the term “conned” is interesting. Are you willing to share with me further what you mean by that term and the one or two of the pieces of evidence that supports your contention? If you don't already know, at least intuitively, why I use that verb "to con" in connection with the founder of Trump University, nothing I say here will convince you. "This [rough and high] spirit [that opposes Christ] cries, 'We must not judge conscience, we must not judge matters of faith, we must not judge spirits, or religions.' Yes, they that are in the pure spirit and power of God, which the apostles were in, judge of conscience, whether it be a seared conscience, or a tender conscience; they judge of faith, whether it be a dead one, or a living one; they judge of religion, whether it be vain, or pure and undefiled; they judge of spirits, and try them, whether they be of God, or not; they judge of hope, whether it be that of hypocrites, or the true hope that purifies, even as God is pure; they judge of belief, whether it be that which is born of God, and overcomes the world, or that which runs into the spirit of the world, which lusts to envy, and does not overcome the world; they judge of worships, whether they be will-worships, and the worship of the beast and dragon, or the worship of God in spirit and in truth; they judge of angels, whether they be fallen, or those that keep their habitation; they judge the world, that grieves and quenches the spirit, hates the light, turns the grace of God into wantonness, and resists the holy ghost. They judge of the hearts, ears and lips …"
Johan. I assume by your answer to my question that you do not wish to engage in a discussion about your judgement concerning Donald Turmp. That is fair enough. Your answer in itself is instructive. As to your quote. I am not guide or informed by the words of George Fox. Although, I do read from his writings weekly. In many things he and I are led by the appearance of the inshining Light in our conscience in difference ways. I am well versed in this sentiment you have shared here. I am also aware that he has expressed the opposite sentiment elsewhere in his wiritings. I accept his sentiment as a validation of your own and that of many others. I am come into a different conscience and consciousness as did many other Quakers contemporary to George Fox. I would love to read more of your thoughts specifically on how he has conned his way into the Presidency; for that was the import behind your original statement above. In any case, thank you for engaging with me to the extent you have. You're right, I don't want to engage in a discussion here. If you believe that I have mischaracterized D.T. or his methods, I can accept that. Both points of view are out in the public, voluminously documented on both sides, and my judgment is that the evidence is overwhelming that he misrepresented himself to his base, and they mistakenly voted for someone who did and does not have their best interests at heart. I do not believe that I'm bearing false witness. However, I understand that I'm fallible. Just to be clear. I have no judgement whether you have mischaracterized Donald Trump. I was merely trying to elicit further explaination from you concerning your stated judgement that Donald Trump has conned his way into the Presidency. I was merely attempting to gain further understanding of your words. Neither of these posts look directly at the issue of Trump as con artist (except for a brief reference to Trump University), but it is implied: I doubt very many voters actually voted for the package of qualities I associate with Trump. He has therefore presented himself as able to fulfill a role that he has not demonstrated the competence to fulfill. Some small segment of the electorate probably actually does want a disruptive bully as president; I suppose for them, he actually does not represent a successful con. It might also be fair to ask whether he was guilty of fraud all along if it turns out to be true, as is sometimes rumored, that he never expected to win. That would be a game of a different sort. The phrase “degradation of political culture” is particularly instructive and informative relative to Donald Trump and your contention (in this piece) that he conned his way to the Presidency. I kept stumbling over the term “conned” relative to the point you were making then I came across a meaning for con as ‘an abuse of confidence.’ It made me wonder. To expound a bit further. It is certainly true that Donald Trump does not respect political culture. He has made it clear that his engagement with the political culture is a necessary evil in order to influence policy and political decision making to benefit his business interest. He has said that he donates money to both republican and democrat parties because he expects influence. It is also true that his stated interest is in changing the political culture so that it serves economic interests in general, not merely his own. His slashing of regulations and streamlining of the regulatory process are just a couple of many examples. He just does not value the oversight or management or administration of the political cultural in matters of business and human relations in general. It seems to me you are suggesting that Donald Trump conned his way to the Presidency by misusing or abusing the confidence in electoral process and the office of the Presidency to degrade the political culture for personal and general economic interest. I’m stumbling here a bit because I’m not so much interested in what I think you think than in getting at an understanding of you think. Am I getting close? I appreciate your sense that “engagement ... is the way of love.” Those words deepened me down so that I could feel the Foundation itself. Hello again, Keith. You charitably summarize my "con" argument this way: "It seems to me you are suggesting that Donald Trump conned his way to the Presidency by misusing or abusing the confidence in electoral process and the office of the Presidency to degrade the political culture for personal and general economic interest." I don't think that Trump set out to degrade the political process. My argument is slightly simpler: He tricked a significant number of voters into believing that he would be a more competent leader than Hillary Clinton. Her case depended at least in part on her resume (activist, Senator, Secretary of State, etc.) and, consequently, her familiarity with how things are done, along with her policy priorities, which were standard-issue centrist reforms. Trump's case was dramatically different. He denounced the political and financial establishment ("the swamp") and said, basically, "Rely on my intelligence and intuition as a get-it-done businessman who gives it to you straight." His utter disdain for political correctness simply reinforces this impression as someone who is not controlled by convention or the establishment. Now I'm sure that a certain segment of his base has in fact gotten what he promised and demonstrated before the election: a transgressive figure with no verbal filter. This bull-in-a-china-shop behavior continues to delight them. This may be a function of their extreme alienation from the politics of the past; I just don't know. But it would be wrong for me to say that this specific segment was conned into voting for Trump. I simply cannot believe that this segment accounts for all 60 million of his voters. Among those voters must be millions who actually believed his promises to clean out the swamp and who took his claims of expertise at face value. They surely hoped that his brutish behavior would cause a creative upset, not a destructive one. These are the people who were conned, in my opinion. They did NOT expect the degradation, collapse of worthwhile norms, administrative incompetence, chaotic and contradictory political signals, and exaltation of wealth that have marked his tenure so far. They may have made a comparison between Candidate Trump as intuitive genius and Hillary Clinton as the "swamp" candidate, but not between her and the rolling crisis we're experiencing now. PS: It's not a "con" if he didn't intend to deceive, so my argument above is a bit incomplete. What really seems deceptive to me are two things: the "drain the swamp" claim, when in reality his regime is marked by very wealthy and well-connected Cabinet members and others; and the claim of being more intelligent and better-informed than others (in some cases FAR better), when he apparently counted on being able to operate by feel and fiat. It doesn't seem quite fair to charge that he fully intended to make such a mess of things, or to wander so close to authoritarianism. But, whatever he intended, his actions, compromises, and inadequacies have led us into crisis territory. And all that is without considering whether he is so beholden to actors in Russia that he cannot act to secure our electronic borders. Thank you. Your responses were helpful in better understanding your meaning. By the way, I had thought to visit Eugene Friends Church after attending Eugene Friends Meeting for worship this past first day if I had an opening to attend only the nine o’clock silent meetings and not the eleven o’clock meeting. However, the impulse to attend Eugene Friends Meeting was originally to participate in both silent meetings, which I adhered to. I hope one day to visit Eugene Friends Church and perhaps meet you. I live in Bandon, Or.